More and more mushroom species are being cultivated and becoming available in grocery stores. The white button mushroomAgaricus biosporus--dominated the retail scene for decades; then came the cremini (which is simply a brown Agaricus) and the portobello (which is a mature cremini). Oyster mushrooms and shitake arrived next, and their reasonable price is a testament to how mainstream they’ve become. Now hen-of-the-woods, one of my favorites, is successfully cultivated, and enoki, royal trumpets and lion’s mane (also known as pom-poms) are available as well. When the mushrooms look good and the price is right, I buy in quantity and put them up. I like precooking and freezing mushrooms because the flavor is retained nicely, and it is a pretty quick way to process them. But if expediency is all, then why bother precooking? Because when you freeze foods with a high water content like mushrooms, the water within the cells crystallizes and ruptures the cell walls. This is one of the reasons why some fresh frozen foods like strawberries seem mushy once you’ve defrosted them. But when you pre-cook the mushrooms to the point of their releasing their liquid, you are diminishing the amount of water within the food, which in turn diminishes the crystal load in the cells. The second reason why you should precook mushrooms is because the heat from cooking inactivates the enzymatic action of the food. Enzymes are the proteins in plants and animals that help them mature. If you freeze without a precooking stage, the enzymes will continue to age the mushrooms--albeit slowlyand undermine their flavor, texture, and color. 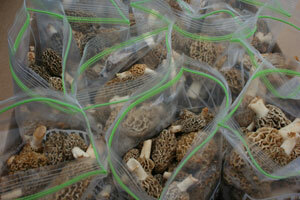 Additionally, some wild mushrooms pick up pathogens from the soil that can disrupt the flavor. I used to freeze chanterelles raw and couldn’t figure out why they sometimes had a tinny taste when I cooked them. It turns out the pathogen is not destroyed by freezingits life cycle is only slowed downso the flavor becomes progressively compromised in relation to how long the mushroom is frozen. Precooking very fresh wild mushrooms neutralizes those pathogens. That is not to say that precooking neutralizes toxins. There is nothing you can do to make a poisonous mushroom edible, so don’t eat a wild mushroom whose identity you wouldn’t bet your life on. 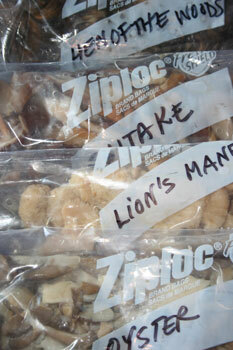 Below is my method for freezing cultivated and wild mushrooms. Do save the stemmy parts and any hard bits that you would otherwise discard. They will make a fabulous mushroom stock that you can use in soup, stews, risotto, and pasta sauces. Generally hen-of-the-woods, oysters, and shitakes produce the most byproduct in the way of hard stems. Precooked frozen mushrooms hold beautifully in the freezer for 9 months to a year. But be sure your freezer is cold. Zero degrees will hold the mushrooms for the full time period. If your freezer is warmer, use the foods sooner for best results. Melt the butter in a large non-stick skillet over a medium heat. In batches, add the mushrooms, turn the heat down to medium low, and cook for 5 minutes, stirring occasionally and flipping over the slices, until the mushrooms release their liquid. If you were going to eat the mushrooms right away, you would cook them until their liquid evaporated, another 5 minutes, but to preserve, it is best for the mushrooms to be frozen in their liquid. The liquid protects the delicate tissue of the mushrooms much the same way that sugar syrup protects pit fruit when you freeze it. Dump the mushrooms and their liquid into a bowl, allow to cool, then pack the mushrooms and liquid equally into 4 freezer baggies (about 2 cups per baggie). Push the air out of the baggies, seal and freeze. To defrost, place the mushrooms in the refrigerator. They will be ready to cook in about 1 hour. If they are still frosty when you are ready to cook them, it’s OK. You can dump the frozen mushrooms directly into stews and soups. Note: Morels tend to capture sand and dirt in the brainy folds of their cap, so you should swish them thoroughly in a bowl of water, otherwise they could be gritty. Take all the stems and hard bits from the mushroomseven if you only have a cup or two of them, it’s worth making stock. In a small soup pot add a chunk of peeled onion, a piece of celery, a few garlic cloves, a couple of sprigs of thyme and flat-leafed parsley, few peppercorns, and a bay leaf. Cover with water, cover the pot, and bring to a boil over a medium heat. Lower the heat to medium low and cook for about 30 minutes, until the liquid is light brown and you can smell the mushroomy fragrance. (If you are only making 2 cups of stock from 1 cup of stems, watch to be sure you don’t lose it all to evaporation.) Sometimes I strain off this liquid and set it aside, and add more water and start over, trying to eek out every bit of mushroom flavor. Strain the stock and pour into a clean jar, refrigerate, and use within three days. If you don’t use within three days, just bring the stock to a boil for 10 minutes to sterilize, and return to a clean jar. You will lose some volume. You can also freeze the stock. It holds for 9 months to a year. Let’s say you end up with just a cup and a half of stock. That’s great! Next time you cook a beef stew, add it. The meaty flavor of mushrooms (the Japanese call that flavor umami), enhances the taste of meat dishes.